"I love working with entrepreneurs who are ambitious and focused on the user. The best ones I have been lucky to work with are confident without attitude. If you are applying computer science & design to massive markets and want to make millions of users happy, I’d love to team up with you!" Keval invests in digital media, consumer Internet and mobile companies. 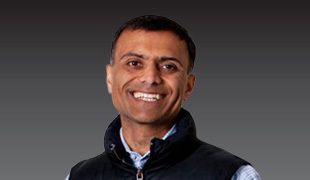 Keval, a past Google executive and well-known angel investor, joined InterWest's IT team in 2011. He is a board member at AdsNative, Cuyana, Grokker, Joyus, LocBox, The RealReal and Triposo, and serves as a board observer at Apteligent. Keval is also an investor in Aviate, Canva, CrowdPac, Famo.us, Knotch, GainFitness, HireArt, Optimizely, Victorious, Vidora and Wand Labs. As Google's former director of product management, Keval led teams that launched new advertising products and businesses — including video/TV ads and an expansion of AdWords. He also launched syndication of Google's products to third parties. Prior to InterWest, he was an angel investor in several start-ups including Aereo, Aviate, MyLikes, Backblaze, Rixty, SetJam (acquired by Motorola Mobility/Google) and investor in AngelPad, a startup accelerator. tomorrow's decision makers, my partners at InterWest and I are open for business. We want to help accelerate your vision.